Read the first chapter of Across the Blue. 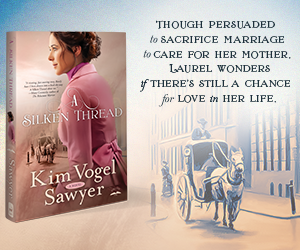 Set in Edwardian England and ideal for readers who enjoy Julie Klassen novels, this romance about an English aviation pioneer and the girl who falls in love with him is filled with adventure and faith. Isabella Grayson, the eldest daughter of a wealthy, English newspaper magnate, longs to become a journalist, but her parents don't approve. They want her to marry well and help them gain a higher standing in society. After she writes an anonymous letter to the editor that impresses her father, her parents reluctantly agree she can write a series of articles about aviation and the race to fly across the English Channel, but only if she promises to accept a marriage proposal within the year. When James Drake, an aspiring aviator, crashes his flying machine at the Grayson's new estate, Bella is intrigued. James is determined to be the first to fly across the Channel and win the prize Mr. Grayson's newspaper is offering. He hopes it will help him secure a government contract to build airplanes and redeem a terrible family secret. James wants to win Bella's heart, but his background and lack of social standing make it unlikely her parents would approve. If he fails to achieve his dream, how will he win the love and respect he is seeking? Will Bella's faith and support help him find the strength and courage he needs when unexpected events turn their world upside down? Pre-order you copy of Across the Blue today! Purchase a copy from your favorite retailer here. The charm of Downton Abbey meets the adventurous spirit of the Wright Brothers in award-winning author Carrie Turansky’s newest standalone novel, Across the Blue (Multnomah, Feb. 20, 2018). Set in Edwardian England, Across­ the Blue tells the story of Isabella Grayson (Bella), an aspiring female journalist in a male-dominated field, and James Drake, a daring aviator in the race to make the first flight across the English Channel. When James crashes his flying machine on the Grayson’s palatial estate, Bella, having her own interest in aviation, is immediately intrigued. Bella’s father, the owner of three London newspapers, reluctantly allows her to write a series of articles following the race across the English Channel, but at a price. She must accept a marriage proposal from a respectable suitor by the end of the year, and with James’s shameful past, he is unlikely to win the approval of her parents. As Bella and James grow closer, their conflicting goals threaten to destroy their chance for lasting love. Can they learn to balance pursuing their own dreams and accepting wisdom and direction from the Lord? And can her parents ever approve of a life they didn’t prescribe for her? Turansky expertly weaves together the history of early aviation and women in journalism with an exciting romance, all the while painting breathtaking pictures of Kent, England, and the White Cliffs of Dover that set the stage for the thrilling race across the channel. Fans of Turansky’s novels, the Edwardian era, and popular British entertainment will love being swept away by the romance and adventure of Across the Blue.